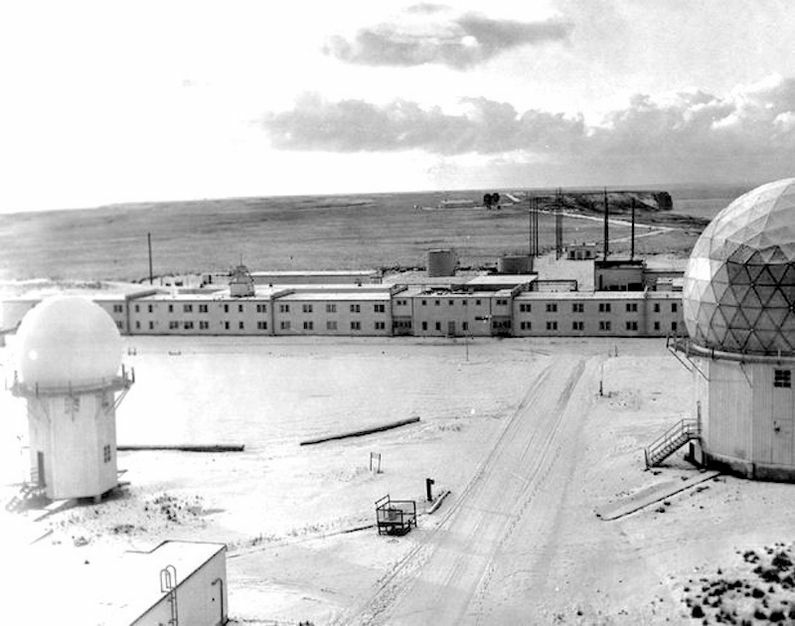 Middleton Island Air Force Station (1958-Present) - A Cold War U.S. Air Force Station, part of the Alaska AC&W Radar Network. Located along the Gulf of Alaska, 65 miles southwest of Cape St. Elias. The island measures only 3.5 miles long and .5 mile wide. Initially functioned as a Ground Control Intercept (GCI) radar site, with a Permanent System ID of F-22. Later redesignated a surveillance site. Deactivated in 1963. Middleton Island Air Force Station Operations Area 1960s. L-to-R FPS-3 Tower, FPS-6 Tower, Operations Building, FPS-4 Tower and FPS-8 Tower. Construction began in 1954 and was completed by 1956 by the Morrison-Knudsen Construction Company under a $2,878,122 contract initially supervised by project engineer Bernard Sturgulewski for the USACE. The radar sets were installed and accepted around August 1956 but were turned off because maintenance personnel and spare parts were not available. The site became operational in May 1958 as Middleton Island Air Force Station manned by the 720th AC&W Squadron which had been activated on 8 Sep 1955 to operate and maintain the site. Initial equipment included an FPS-8 search radar and an FPS-4 height-finder radar. Also installed were an FPS-3 search radar and an FPS-6 height-finder radar. The FPS-3 and the FPS-6 became the primary radars while the FPS-8 and FPS-4 became secondary radars. Aircraft track data from these radars was manually plotted on plotting boards and passed to a Manual Direction Center on voice and teletype circuits. The closure of Middleton Island AFS was publically announced in the Fairbanks Daily News-Miner newspaper on 6 May 1963 and the site ceased operations on the 15th of May 1963. Closure and deactivation of the 720th AC&W Squadron were effective on 1 Oct 1963. Middleton Island was just outside the area of severe arctic weather that covers much of Alaska in the winter months and as a result, the physical plant of the site had some characteristics of AC&W sites in the lower 48. The site was a single level site with the operations area adjacent to the cantonment area but not connected. The operations area had four radar towers and a central radar operations building. Separate buildings contained A/G radio receiver equipment and A/G transmitter equipment. Middleton Island Air Force Station Composite Building. White Alice Tropo Terminal in the Background. The cantonment area functions were mainly contained in a single "T" shaped composite building. The stem of the "T" contains two sections, one housing the site administration offices and the other housing the dining hall. The top of the "T" had six two-story wood-framed sections, three on a side. The three sections on the right side contained the Airmen's quarters while the three sections on the left housed the Officers and NCOs. Four separate buildings alongside the "T" provided utilities, power, HVAC, water and other support functions. A small airstrip provided facilities for fixed wing aircraft and helicopters. No family housing was provided as this was considered a remote unaccompanied tour (1 year). Annual bulk resupply shipments to Middleton Island AFS were sealifted during the summer months under the Mona Lisa and later the Cool Barge programs. Airlift of supplies, mail and personnel were available year-round, weather providing. Separate radio facilities housed the radio transmitter and receiver equipment for communicating with aircraft. After HF radio systems proved inadequate for command and control communications, the Air Force implemented the White Alice Communications System (WACS). 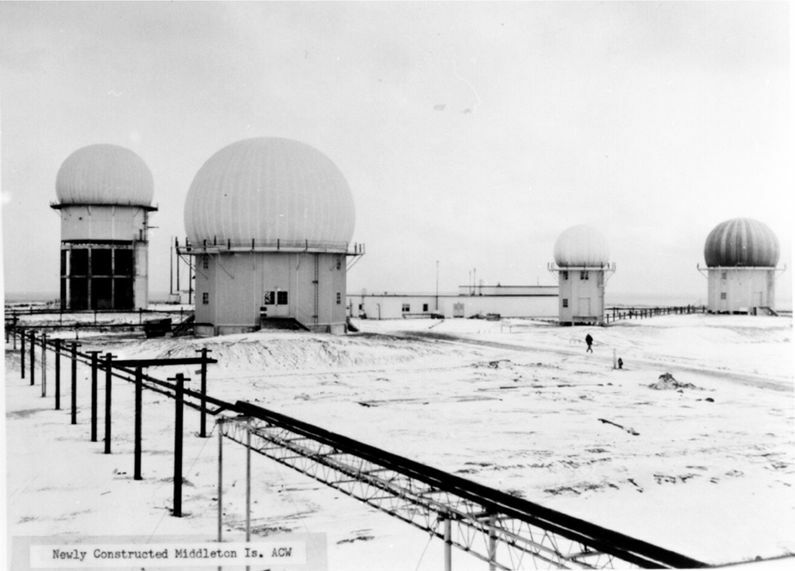 This was a system of tropospheric scatter and microwave radio relay sites constructed during the mid-1950s to provide reliable communications to Alaska Air Command (AAC) AC&W system. The Middleton Island White Alice tropo site was co-located with the AC&W radar site. It was activated on 29 Nov 1956. The site had a single pair of 30' dish tropo antennas, linked to Boswell Bay (69 miles). Facilities included an equipment and power building. Crew quarters and support were provided by the nearby Middleton Island Air Force Station. 8 Sep 1955 - Activated, assigned Headquarters 10th Air Division (Defense). 1 Jun 1957 - Reassigned to Hq 5039th AC&W Group. 1 Nov 1959 - Reassigned 10th Air Division (Defense). 1 Aug 1960 - Reassigned 5070th Air Defense Wing. 1 Oct 1961 - Attached 5040th AB Wg for admin and logistic support. 1962 1963 Major Butler, Owen K. N/A Last Commander? Most of the old AC&W site buildings have been demolished. The site has also had an environmental remediation project that has further erased signs of the old AC&W site and the White Alice tropo site. Location: Middleton Island in Valdez-Cordova Census Area, Alaska. Denfeld, D. Colt Ph.D., The Cold War In Alaska: A Management Plan For Cultural Resources, 1994-1999, U.S. Army Corps of Engineers, August 1994, 327 pages, Pdf, page 118-119, 159-161, 238-239. History of the Aircraft Control and Warning System in Alaska: Air Defense of Arctic Skies, Argonne National Laboratory, Illinois, 2002 updated 2013, 140 pages, Pdf, page 69-70`. This page was last modified 20:23, 31 December 2018 by John Stanton.